In the 1960s, first Guy McCaskie (left), and then Rich Stallcup (right), discovered that birds rarely or never before seen in California could be found at 'vagrant traps' — isolated clumps of trees on the outer coast or in the desert — during spring and fall migrations. By the 1970s, dozens of birders would drive all night to spend major holiday weekends at such isolated spots as Furnace Creek in Death Valley, or Oasis or Deep Springs in California's high desert, because just one eastern migrant could make it all worthwhile . . . It is sometimes hard to imagine a scene like the one shown above: the first ray of dawn on Memorial Day weekend at Furnace Creek Ranch in Death Valley, where dozens of birders have been sleeping on the golf course and are now awakening to see what eastern vagrants the day will bring. Today, in the 21st Century and three decades later, Furnace Creek Ranch is posted and fenced and patrolled; the only places to sleep are the $110/night motel rooms. Now, the few birders who might show up must get off the course before the first golfer appears. But the photo captured a typical scene of how things used to be, when birding was a social sport of eager participants who were pushing the frontiers of bird identification and distribution as fast as they could. It is also hard to recreate the scene below: another Memorial Day weekend, this one at Oasis ranch in Mono County, California. Back in those days the ranch watered the rows of cottonwoods, and birding access was possible. On holiday weekends each spring and fall there would be dozens of birders present, working the trees after driving from San Francisco or Los Angeles to join in this unorganized yet somehow ritual group endeavor. In 1965, Guy McCaskie became the sole regional editor for the "Southern Pacific Coast" Region of Audubon Field Notes, which was to become American Birds (1971), then Field Notes (1994), and then finally North American Birds (1999). He has held that position ever since. [This begins our 25 year period although, for practical purposes, the fall of 1964 is often included.] 1965 was also the year Point Reyes Bird Observatory in Marin County in northern California was established. Thus for both north and south, 1965 is a watershed starting point. In 1989, the California Bird Records Committee (CBRC) completed its "old records review" project and, with the new decade, some 92% of all historic reports of California rarities had been reviewed. Within a year, the CBRC Secretary who oversaw this project would retire and a significant 'changing of the guard' at the CBRC began. Through the 14th CBRC report, which summarized the "old records review" project, ten CBRC members had authored or co-authored CBRC reports. Thereafter, as many "new" names appeared as authors of CBRC reports in the 1990s as had been involved in the previous two decades combined. The start of this 'changing of the guard' within the CBRC is a convenient end-point to the quarter century considered here. The quarter century from 1965 to 1989 witnessed the initiation and rise of two important organizations and their publications, which melded with the pre-existing publication Audubon Field Notes (above left, top row), sponsored by National Audubon Society. The latter journal would, over time, become American Birds (in 1971), go to color covers (1975) and increase in size (1979) before sputtering and down-grading to Field Notes (1994). This important journal would rebound as North American Birds (1999), and is now published by the American Birding Association (ABA). Throughout the years the journal published quarterly seasonal summaries of birds of interest in California's two Regions (essentially, northern and southern California; formal boundary adjustments in the mid-1990s eventually accomplished a clean division between north and south). The two new organizations were California Field Ornithologists (CFO) and the American Birding Association (ABA). 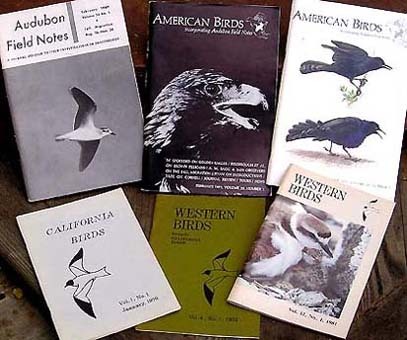 CFO was organized in 1969 and went public in 1970 with its journal California Birds (above left, bottom row). In 1973, the organization changed its name to Western Field Ornithologists, and its journal became Western Birds. The journal publishes peer-reviewed papers on the status, distribution, identification, and conservation ecology of birds in western North America; the journal went to color covers in 1981 and has remained similar in format under long-time editor Phil Unitt. The American Birding Association (ABA) began as a national bird club in 1968. 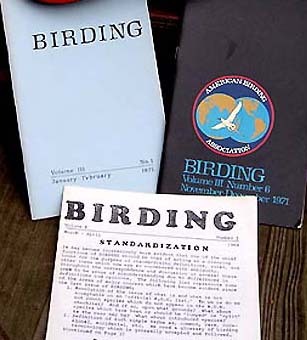 It changed its name to "American Birding Association" in 1969 and began publishing Birding magazine that year (above; right-hand set). The initial mimeographed sheets became a journal by Vol. 3 (1971) and had a color cover with standard logo by Vol. 3, No. 6 (1971). All covers were color by 1979, and the magazine's dimensions increased in 1989 and again in 1995. Today it is a glossy all-color magazine. Once aimed at the "sport" of birding, with emphasis on lists, finding life birds, and competitions (e.g., Big Days, Big Years), the organization first evolved toward more bird identification and bird-finding papers than articles about listing. As the membership grew, the founders lost control of the organization and the emphasis changed again, now focussing on beginning and intermediate birders. At present, papers on identification still appear but topics now include equipment, etiquette, conservation, and aesthetics. Many of those chosen for California's "top 40" during the period under review were involved in one or more of these publications by authoring papers, editing, or serving on the boards of the organizations. By the early 1980s, birders on the 'Death Valley loop' had found a store in Dyer, Nevada, that had cold drinks in the middle of a hot afternoon. 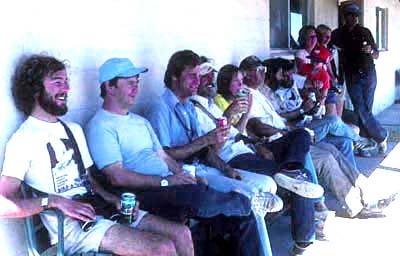 Enjoying a brief rest on 30 May 1982 are (L to R) John Sterling, Phil Swan, Paul Lehman, Richard Webster, Laurie Klaisle, Guy McCaskie, Jerry Oldnettle, John Luther, David Luther (the boy in red hat), Jolee DeLew, and two unidentified. The decades of the 1960s, '70s, and '80s were years of abundant change in the birding world. Birdwatching as an active hobby became increasingly popular throughout the period and multitudes were actively birding by 1990 where there had been but a few in 1965. Those who influenced this period and helped define and direct its changes are those who are considered here for "TOP 40" list of WHO WAS WHO in California birding during this quarter-century. Some important observers had influence for only a comparatively short time, including several early in the period: Paul DeBenedictis, Pierre Devillers, Ted Chase, Joe Greenberg (and his sons Doug & Russ), Bob Paxton, Bob Pyle, Eleanor A. Pugh, and Shirley Wells. Others became important in the mid to late 1980s, including Kurt Campbell, Curtis Marantz, and many who would become CBRC members in the '90s: Shawneen Finnegan, Robb Hamilton, Matt Heindel, Steve Howell, Al Jaramillo, Michael Patten, Mike Rogers, Stephen C. Rottenborn, Mike San Miguel, and Dan Singer. It was difficult choosing 40 observers (well, er, actually 41 with Herb & Olga Clarke in one slot) who had influence over large portions of the quarter-century without adding those whose impacts were of a shorter duration. 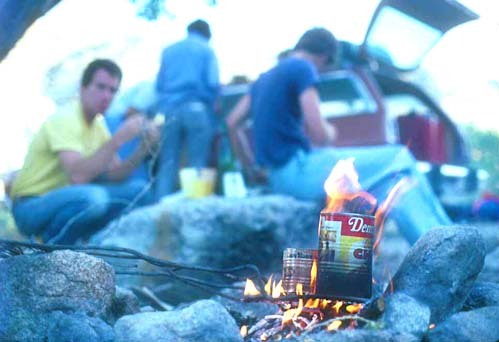 In the 1970s, birders on the 'Death Valley loop' often camped at an informal campsite along Cottonwood Creek, straddling the Inyo-Mono county border, and dinner was what you brought with you. Here's a typical birder dinner in those days — Dinty Moore stew or Dennison's chile heated on the fire. In the background are Brad Schram (yellow shirt) and Paul Lehman (blue T-shirt). In choosing a "top 40" gallery of influential birders, the choices are meant to illustrate those with a statewide impact for a significant period. Those having an impact for at least half the quarter-century — at least 12 years — were strongly preferred. 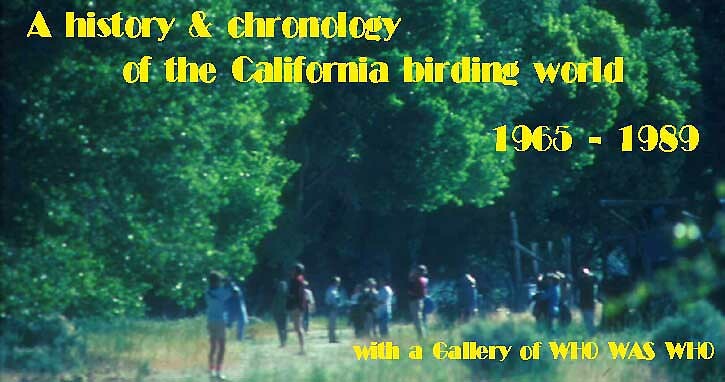 Only 3 of the 40 had a shorter tenure within California during our period of review (Van Remsen, Peter Pyle, John Sterling), and each of these were actively birding in the State for at least 10 years, and each has unique achievements that warrant their inclusion. Was listed among the top three California state listers during the period. Because these choices were those with statewide influence, not primarily county or regional impacts, the field was considerably narrowed. If one were to consider the impact of regional or county birders, those names that spring quickly to mind include (north to south): Stan Harris, Gary Lester, Alan Barron, Tom Schulenberg, Craig Hohenberger, Dave Rudholm (northwest CA); Ray Ekstrom, Mike Robbins (northeast CA); Bruce Deuel, Bob & Carol Yutzy, Kent Van Vuren (n. Sacramento Valley); Ed Harper, Ed Greaves (Sacramento area), Gordon Bolander, John Parmeter (Sonoma, Napa counties); C.J. Ralph, Jules Evens, and Keith Hansen (Marin Co.); Richard Tenaza, Henry Robert, John Smail, and Phil Henderson (Farallon Islands); Howard Cogswell, Art Wang, Jean Richmond, Bob Richmond, Art Edwards, Mary L. Rosegay, Bruce Barrett, and Kurt Campbell (S.F. Bay region); Peter Metropulos, Barry Sauppe (San Mateo Co.; Metropulos also in Mono Co.); David Suddjian, Randy Morgan (Santa Cruz Co.); Ron Branson, Bill Reese, Laidlaw Williams (Monterey Co.); Dave Yee, Rob Hansen, Bob Barnes (San Joaquin Valley & Kern Co.); Tom Edell, Curtis Marantz (San Luis Obispo Co.); Larry Sansone, Mike San Miguel, Hal Baxter, Clyde Bergman, Hank & Priscilla Brodkin, Art & Jan Cupples, and many more (greater L.A. vicinity); Brian Daniels and Doug Willick (Orange & San Diego counties); Steve Cardiff (San Bernardino & Riverside counties); and Tom & Jo Heindel (Inyo Co.). There were also a number of people with wide importance in the fields of bird population survey work or on endangered species, including Joe Jehl, Stephen A. Laymon, Gary Page, Lynne Stenzel, Brian Walton, and John & Ricky Warriner, to name just a few. All photos © to photographers listed on each person's linked page; all rights reserved. I am very grateful to the many photographers who contributed to this project, but particularly wish to thank Barry Clark, Van Remsen, and Brad Schram for digging in their archives for people pictures during the era under review. I have been compiling California bird photos for many years, and many of the shots come from that collection, while others were graciously sent for this specific project. I am also grateful to those who commented on earlier drafts of these pages and made many helpful suggestions: Rita Carratello and Brad Schram read and edited almost the entire text, adding immeasurably to its readability. Additional valuable comments were forwarded by Laurie Binford, Terry Clark, Alan Craig, Paul Lehman, Joe Morlan, Dan Singer, and Jon Winter. 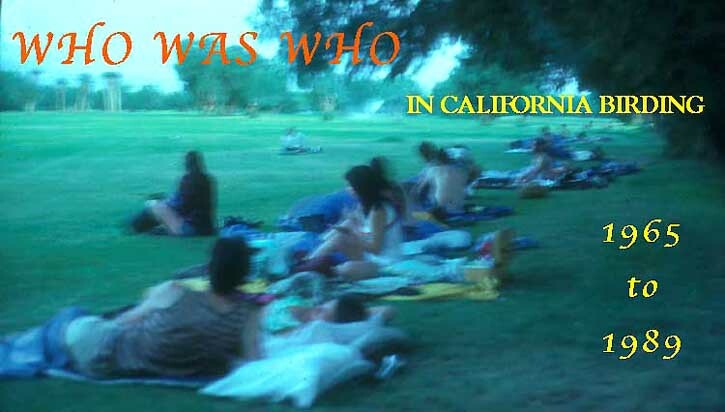 Many others answered specific questions about people or events as the pages were created. Despite this indispensable editing, however, I fear that errors and mistakes still persist, and I welcome additional comments. A nice feature about web projects is that they are easily corrected. The opinions expressed herein are my own, and represent only one person's 'reality.' Others will have different views on various topics covered here.